Modern businesses are using digital signage because it gives them a considerable advantage over their competitors. The number of benefits that a business enjoys when using digital signage or variable message signs are many. Each of these benefits can help your business become more successful. Here is a brief look at the major benefits of using digital signage. First, digital signage helps to do away with waiting time. Also, the costs involved are lower when compared to printing. More importantly, with this kind of signage, it is easy for your business to update content at any time and sometimes almost instantly. Variable message signs (VMS) capturess the attention of 100’s of people daily and can be moved easily. Second, digital signage or variable message signs are impressive. It grabs the attention of everyone and so acts like a magnet that draws customers to your business. In addition, when people view a digital signage they pay more attention to the content displayed. If you want to display promotional content or information or even news, then digital signage will help to grab the attention of your target audience. Third, if you know your competitors are using digital or variable message signage, then you really cannot afford not to jump onboard. The nice thing about using it is you can generate money from advertisers, and if you place the signage in a large shopping center, then the revenue generated by digital signage is significant. Your business can also use digital signage at point of sale. When you do this, your customers become more engaged with your services and products. The nice thing about using digital signage is you can use it as a tool to achieve better customer interaction. Your digital signage functions like a second sales person and will not only inform your customers but also entertain them. With variable message boards, you are also more in control over your message. You can show and also change information according to your needs. Depending on what you think is best for your business, you can tailor your message to achieve maximum impact. Another reason using digital signage is a good idea, is it helps to create the right atmosphere. In fact, it makes the atmosphere livelier, and in addition, the signage is also very attractive. So, if you want to create unique atmosphere then you should seriously think about using digital signage. In today’s business environment, organization after organization is adding benefits to their employees. There was a time when there are specific and standardized rewards offered by the organization in terms of cash. Now things have changed, and organizations cannot simply satisfy their employees by giving them financial benefits and benefits. The reward and benefits employee receives from their organization improves motivation, job satisfaction, self-esteem and ability to perform better. An organization can give a reward to their employee in a number of ways; some of them are listed below. Lunch with top management- Very few employees will get a chance in their life to sit with CEO/President/Chairman at a lunch. Give a chance to you employee to sit with you on a lunch, to better understand you in an informal setting. Parking Spot- There is always a parking spot in every office, some of the organizations designated special parking lot for CEO/President. Reserve a parking lot for the best performer as it is one of the best rewards for an employee. Books- As a reward, you can help your employee to improve their mastery in any subject; you can offer digital audiobooks and eBooks to your employee. Work from home- Working from home is one of the greatest rewards employee can get. If you have a sound infrastructure that a supports and allow an employee to work from their home, this gives flexibility and autonomy of work to an employee. Gym Membership- A gym membership is a great way to help employees to maintain their physical and mental health. A healthy employee can achieve its personal as well as organizational goals efficiently. Early Release- Think back to your old school days, and remember the joy of early release. Ask you best employee to leave the workplace early and spend time with family and friends. 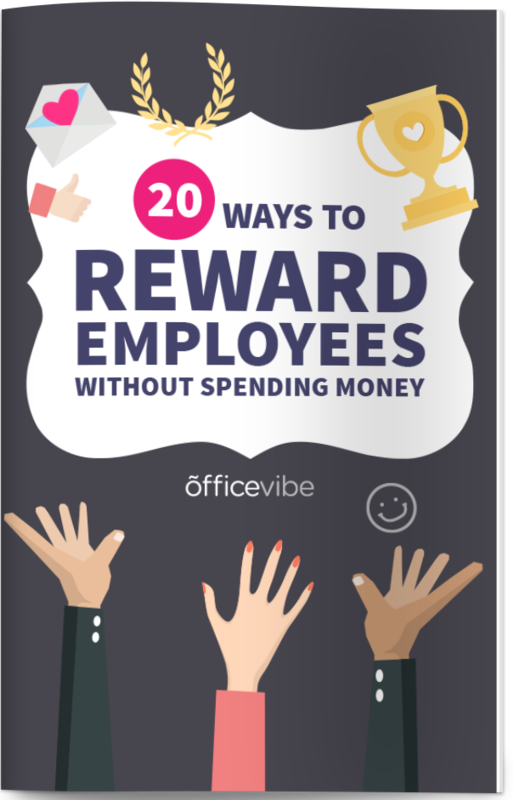 Rewards like these are important because it allows the employee to give ample time to their friends, family, and relatives and becomes more loyal to the organization. Happy Hour- Happy hours are one of the most efficient ways to reward your employees. The main purpose of the reward is to get everyone together outside the workplace in a more relaxed and natural setting. An employee feels more relaxed and stress-free and gets away from the tensions of daily official work. Team Lunch- It is always a better choice to go out for a lunch or dinner with the teammates. Moreover, a team lunch allows the team member to know each other and enjoy each other company in a different environment. Travel- If you have more than one office, offer your employees an opportunity to spend time in different office, it is a great way to break the boredom of the daily routine. It is a reward for those employees who may never meet each other to forge valuable relationships. In the news- Tell your local newspaper about the performance of your employee and run a press release. When the news is published in the paper, get the article frame and give it to your employee as a reward. There are employees that just do their job, work from 9 to 5 and then go home. But there are also people that go above and beyond the call of duty. It’s that type of person that you need to encourage and reward the best way you can. There are lots of times when people like this don’t get all the credit, which is why you have to reward them the best way you can. Lots of employees want to have a chat with the company’s CEO. But most of the time the CEO is very busy, or he just can’t focus on talking with all employees. It’s a nice experience to talk with the CEO and let him know your thoughts, and this is why you may want to give this opportunity a shot! If the parking spot is limited, one of the benefits that you can offer to your 5-star employee is a better parking space. You can’t imagine how much of a morale boost this can bring, so try to check that out right away. When you see that someone works very hard, maybe it’s time to think about a promotion. Sure, there’s no need to rush in here, instead study if the employee has the skills to become a leader or if he can undertake more responsibilities. If he can, then a promotion is in order. This is a very interesting benefit. Lots of great employees want to have their pet with them, mainly because they don’t have anyone else at home and the pet is sitting there, waiting for his master to get home. Bringing your pet to work is one of those nice experiences that will pay off a lot in the end. Through these classes, the employee will be able to share his knowledge with others. It’s a much better way to help your great employee grow even further. He can develop new skills and results will be a lot more impressive in the end. It works amazingly well, and you may want to check him out. Instead of bringing him a better position within the company, you can allow your employee to control a smaller team. This will still be a leading position, and you can watch him grow. It helps further develop his character, and in the end, it can pay off very well. Should you reward your 5-star employee? Absolutely! This will help boost the morale, and it can bring in front some amazing, incredible features. It certainly pays off very well, so check that out, and it will be extraordinary in the end. Plus, all of these are amazing ideas that will help your employee grow even further. On top of that, the morale level will be off the charts, so your best employee will get to be even more productive. This is the type of incentive that pays off immensely for the longer term! The rewards that you give to your employees don’t get lost ever! It actually returns back to you indirectly. Actually, rewarding your employees boosts the motivation of your employees and we all know that the motivation factor works best in the better and healthy development of the employees’ skills. Now, here the question arises. How to reward your customers without money. There are many ways in which you can actually reward your customers without paying them direct money. No doubt, all the other less-costly ways are an effective and most important factor that must be kept in mind is that these methods will remain effective unless or until they are done with deep inner happiness! It matters a lot actually! By simply saying “Thank you” in a slight sincere method can bring a great motivation within your employees. You can simply say thank you or write it on a piece of paper and hang it on the door of your employee in order to give your employees honor. In order to honor your employees, you can simply throw a pizza party to make them sure that you literally care and appreciate the good efforts of your employees. Moreover, you can also give them extra break time. The option of giving them a lunch in a hotel or simply giving them extra lunch time will be an effective choice to opt. You can also give them cards with beautiful looks and write some words of thankfulness. Also, you can send your employees emails to honor them officially. These tricks literally work because it appreciates the efforts of your employees. Moreover, it also motivates your employees. You can also include lottery tickets in the cards to make them happy. You can give them a surprise party to make them a sudden pulse of happiness. You can also wash their car without mentioning them. Moreover, cleaning their house will be a great option. All you have to keep in mind is that you must do something that will bring happiness to your employees and you must do something that, somehow, your employee needs. Doing something unique will be a great choice because your employees will surely remember that uniqueness for a long time. Putting a funny and unusual object on your employee’s desk will be a unique and great idea. Also, you can buy dozens of donuts and announce in the office that these donuts are only for special employees (those employees which you want to motivate or give honor). If you have a very good employee that works very hard, then it can be a stellar idea to reward him. But you don’t have to bring in a huge budget for this. There are lots of inexpensive ideas that you can use in order to make your best employee feel special. Here are some of the things you can keep in mind! Featuring your best employee in the company newsletter is a huge honor. Obviously, this will bring in front a massive morale boost, and your best employee does deserve it for sure. At the end of the day, doing this is free, but it can pay off very well in the end. These are inexpensive baskets that can be full of sweets. It won’t cost you much to get one, but the morale boost is real, and it’s easy to see how much it will benefit your audience in the end. Many companies have a uniform, and everyone has to use it. However, you do need to reward your employee, and one great way to do that is to let him dress casually. It works very well, and it can offer some amazing opportunities and results in the end. Another interesting approach is to let the employee swap tasks with others, especially people with a higher rank. It comes in handy, and it can offer you a plethora of benefits in no time. Let’s face it, arranging something like this is inexpensive. However, it can bring in front a massive morale boost, and it’s just offering a plethora of incredible benefits to your best employee. In the end, everyone gets to be happy, and that’s matters the most for sure. The card can have movie tickets or lottery tickets or just about anything you want. The idea is to be creative here. The more you take your time and avoid rushing, the better the results will be. There’s certainly quite the challenge when it comes to rewarding your employee, but a set of lottery or movie tickets are a very good reward. The pizza party can be a morale boost, and anyone in the company gets to congratulate the best employee. It works great for most companies, and you should check it out right away. Being sincere and thanking the employee will also work. Sometimes, your best employee doesn’t need a lot more than your acknowledgment. This can easily bring in front some extraordinary opportunities. This will also be an honor for the best employee, and it will obviously bring in front a major morale boost. It works very well, and you want to approach that with the utmost focus and confidence. At the end of the day, all of these are great ideas that you do not want to miss. Just consider checking them out, and you will get to boost employee morale level. It certainly is impressive, and the experience shines because of that!